according to common lore and the book of old fishwives tales, if you can incorporate any activity into your schedule for a minimum of twenty-one days, it becomes a habit and no longer a chore. granted, i can think of one or two itinerant exceptions to that, but in the main, those old fishwives are probably correct. that's sort of how i get by updating the post each day. the daily scribble has become so much a part of everyday life, that it has become a permanent part of my psyche. and in the main, i look forward to finding out what the heck i'm going to write each day. even washing the dishes after tea each day allows me the opportunity to listen to several of the jazz albums of which no-one else wishes to be within earshot. 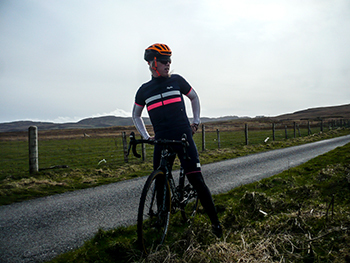 that does not explain, however, despite spending pretty much an entire winter battling galeforce headwinds and crosswinds, that this aspect of our hebridean existence is still worthy of comment. in mitigation, its repetitive appearance in these very pixels is probably more a part of the contention that, while everyone else has climate, we have weather. after all, rain is very much a part of daily conversation from lands end to john o'groats, despite its having been around for a darned sight longer than the prophetic twenty-one days. wind is, of course, an effect of atmospheric pressure, every bit as true after a tin of beans or plate of brussels sprouts as it is for atlantic weather fronts. perhaps a tad tautologically, an area of high pressure will tend to repel all boarders, since the only insurgents are likely to be of lower pressure. areas of whichever pressure rarely hang about for long and when a high pressure is eventually replaced with an area of low, any neighbouring areas of higher pressure will, like fools, rush in to equalise the situation. if you've ever watched those little tellies on the back of aircraft seats, not only will they indicate how far along the flight path the aircraft has reached, but at what speed it is travelling. and quite often, it will also dispense information relating to the windspeed; a heck of a lot faster than even those we're used to in the hebrides. the reason for this slowing is that of friction close to the earth's surface. if you ever meet the guy who invented friction, give him a high-five from me. yet despite my understanding of the principle relating to habit, there is little doubt that the constantly changing speed and direction of localised wind, whether named by the met office or not, impinges on our appreciation of pedalling speed. and i do appreciate you pointing out that a galeforce headwind has to become a galeforce tailwind at some point, but if you've ever got half an hour or so, i'd be more than willing to debate that contention. your acceptance of my reality might well help to understand why any item of cycling apparel prefixed by the word windblock elicits such apparent fervour. 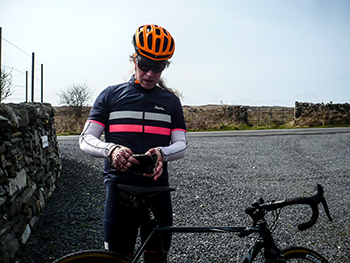 rapha have recently taken to developing their esteemed brevet range, clothing designed to minimise even the smallest hardships to be experienced by riding a large quantity of kilometres in one (almost) manageable chunk. prior to the arrival of the current item, imperial works released a rather fine pair of bibshorts, that not only cosset those honed thighs with an immaculate softness of constitution, but feature the innate ability to dry overnight. several hundred kilometres at one sitting are hard enough all on their own without the added discomfort of a damp chamois pad. this designed ability, welcome though it is, would be conceivably undermined were the bibshorts to be matched with a jersey that failed to equal such speedy dessication. 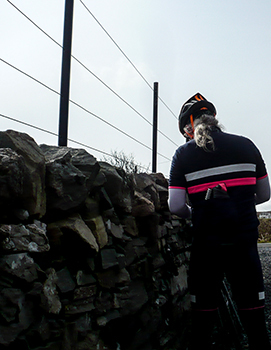 gratifyingly, this newest of brevet jerseys from rapha accomplishes this magic with ease. it is almost easy to see how this is attained; the merino wool verges on the transparent if you hold it up to the bathroom light. such incredible lightness of being translates into a jersey that is astoundingly comfortable to wear. but merino that is thinner than mrs washingmachinepost's kitchen roll is highly unlikely to keep the wind at bay, which is where the brevet gilet enters the room. you may recall that my review of the latter praised not only its thermal properties but its very own windblocking properties. 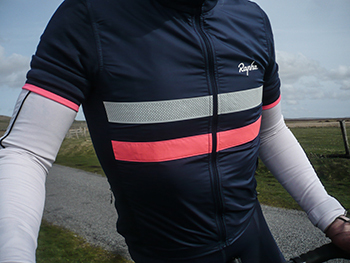 buoyed with this particular propensity, rapha have overlaid a panel of the very same fabric across the jersey's frontispiece and on an impressively tall collar. in this it is almost singularly unique, at least as far as jerseys are concerned. rapha's own winter jersey features the windproofing panels on the inside of the sportwool, as indeed does the recently reviewed city-riding wool windjacket. however, given the gilet fabric's wind and water resistance, sticking it on the outside seems perhaps the best of ideas. aside from the expected three rear pockets, the zipped fourth appears on the left front, the pocket space intruding (if i may use such a word) forwards rather than rearwards. i'm ashamed to admit i made no use of this pocket throughout the review period, but i did perhaps overuse its three rear-mounted brethren with gilet, waterproof, essentials case, mini-pump, spare gloves and even a musette. if you take into account the notion that brevet riding, also referred to as randonée or audax, is over extended distances, several of which might just invade the hours of darkness, then some form of visibility would not go amiss. this is taken care of with both hi-vis pink (on the blue jersey) and reflective white hoops front and back, or dark grey on the black version. 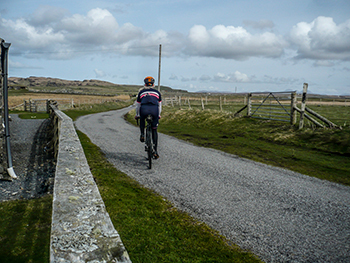 though islay has been blessed with a veritable peppering of sunny days of late, the habitual wind rarely goes away. as i said only the other day, when xc weather tells you that the wind speed will be in single digits, they're probably fibbing. my travails over the past week have brought me into contact with truckloads of wind, some cold, some less so, but it gives great pleasure to make mention that it all remained satisfyingly on the outside of the jersey. 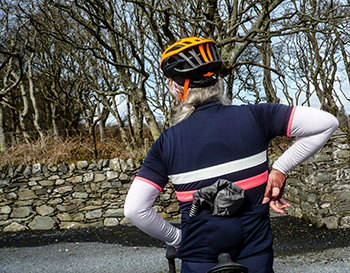 though the windblocking fabric on the gilet exhibits a grateful amount of breathability, leaving the back of the jersey unsullied is a most welcome choice. and it dries overnight, no matter how many kilometres you managed beforehand. 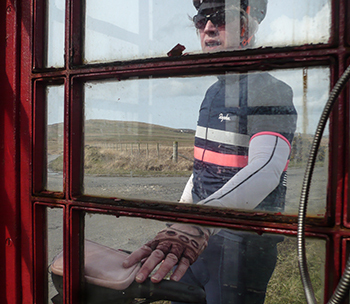 rapha's brevet windblock jersey is available in black or blue with either white and pink stripes or white and grey. sizing is from xs to xxl at a price of £135.